Is Your Heroine an Animated Character? Hers Is. Darrin Butters goes to work every day knowing that what he’s creating will very likely move audiences. He’s in the entertainment industry, so his job security kind of relies on his ability to move people in some way. His work might move people to laugh. To think. To cry. His most recent project for Disney, the film Moana, did just that. And he had a front row seat to its impact. After speaking to a packed house of film students at Grand Canyon University in Phoenix as part of an outreach event for Disney coordinated by Fingerpaint, Butters watched as Kennedi Martin broke down. She hugged him. Then stepped back. Then cupped her face with her hands. She was standing in front of an animator for Disney and she couldn’t believe she was crying. The daughter of immigrant parents, Martin was moved at the very idea that Disney’s latest heroine shares the same skin color as her Filipino family. She was moved that the film’s lead character is a strong, young woman of color. 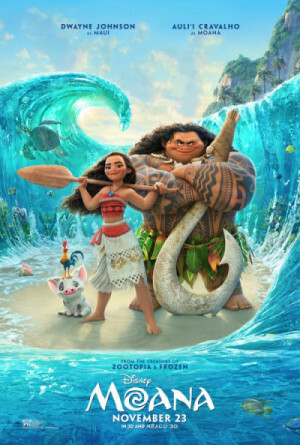 In an ironic twist, the most emotional exchange at the student event delicately dovetails with the central theme of Moana, which focuses on a teenage girl wrestling with tradition and her future as she ventures out to find her place in the world. For Butters, his place is pretty solid. A seasoned animator for Disney, Butters has played a role in bringing dozens of beloved characters to life, including those in films such as Bolt, Tangled, Meet the Robinsons, Wreck-It Ralph, Big Hero 6, Frozen and Zootopia. Even in the face of an impressive portfolio of work, Butters admits he might have squealed a little when he found out he’d be working on Moana with directors John Musker and Ron Clements, heavyweights behind classics such as The Little Mermaid, Aladdin, The Princess and the Frog and Hercules. And, he was energized to help tell a story about characters who are inspired by real cultural stories, unearthed by extensive research of the Pacific Islands and those who live there. In fact, the film is so rooted in cultural research, that executives formed the Oceanic Story Trust, a group of locals who grounded the story and offered perspective when it was needed. And it’s very likely that Martin, the hopeful screenwriter, would not have been moved to the extent she was without that type of commitment. While Moana is a strong heroine with dark skin, no prince and enough guts to face down a centuries-old antagonist, she represents opportunity to Martin. By telling this type of story, Disney showed her that there is a “whole entire world” of possibilities, she said. Twenty years after joining the entertainment industry, Butters said his satisfaction has evolved from seeing his credit on a film to earning credits alongside “amazing” artists to watching an audience react to his work. That’s where he is now. “I realize how meaningful my job is to some people,” he said.